In concurrent story lines, Hannah lives out the effects of each decision. Quickly, these parallel universes develop into radically different stories with large-scale consequences for Hannah, as well as the people around her. As the two alternate realities run their course, Maybe in Another Life raises questions about fate and true love: Is anything meant to be? How much in our life is determined by chance? And perhaps, most compellingly: Is there such a thing as a soul mate? When I was reading the first chapter of this, I was really worried that I was going to hate it. I didn’t click with Hannah right away, and in that first part she seems so… whiny and needy and… terrible. She was not someone I wanted to click with, to be perfectly honest. But then, I kept reading and it clicked and the story got SO GOOD. I’m so glad I stuck with it! I know I say this a lot, but I really haven’t ever read anything like this before. It’s two separate stories, about the same girl – the only difference is the decision she made one night and how her life played out afterwards. It’s a great reminder of how the littlest things can send your entire life down a completely different track and I love that lesson! Have you ever thought ‘if I had done x instead of x… where would I be right now?’ or ‘if I had taken this job instead of this one… would I have met this person still?’ – it’s crazy to think that all of these seemingly little decisions we make every day of our lives, add up to such big ones! I will say that I favored one storyline much more than another… the one where Hannah leaves the bar, I think is my favorite. She grows so much because of the incidents that follow, matures and finds someone absolutely perfect for her. On the other hand, I love Hannah and Gabby’s relationship/friendship/being there for eachother in the storyline where she stays at the bar… either way though, I love the book! 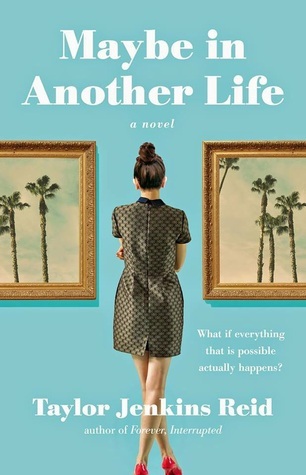 I gave Maybe in Another Life 5/5 stars on Goodreads & I definitely say take a chance on this one – stick through the first chapter, stick through until you see the different paths Hannah has in front of her, and I’m betting by then? You’ll be hooked just like I was. I agree that the storyline with her leaving the bar was my favorite. I loved Hannah and Gabby’s relationship in both timelines, though.